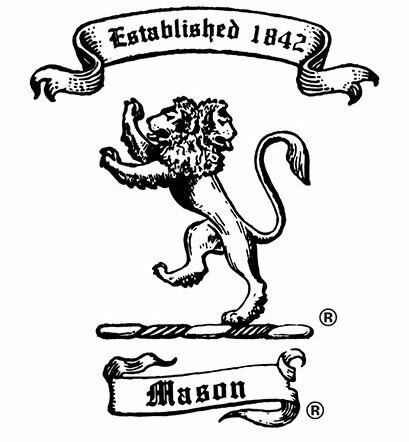 Mason Color Works was founded in 1842 as Bleak Place Color Works in Stoke-on-Trent, Staffordshire, England by James and Mary Skerratt Mason. Mary was a well-known color chemist who developed many of the inorganic pigments which are still used in the whiteware industry today. Together they operated the plant until James' death in 1865. Their only child, Augustus Frederick Mason, with his wife, Keziah Jones, took ownership and continued producing pigments at Bleak Place. Their son, Fortunatus Quartus, (or F.Q. as he was widely known) took an interest in the family business and started his apprenticeship under his parents. He also earned degrees in both inorganic chemistry and analysis from the Wedgwood Institute. In 1902, F .Q. Mason, with formulas in hand, sailed to the United States with a vision of continuing his family's legacy. He settled in the small town of East Liverpool, Ohio, which was known as the Pottery Capital of the World. There he established Mason Color and Chemical Works. Through perseverance and hard work, The Great Depression and three wars, he managed to maintain his business and sold colors to potteries locally and throughout the U.S.
F.Q. died in 1961. His son and daughter, Ronald K. Mason and Gertrude Mason Lowe, continued manufacturing inorganic pigments. Ron became highly respected in the ceramic industry for his knowledge of ceramic colors and applications. In 1964, he and his business colleague, Josephine Gitter, the first woman ceramic engineer in the United States, began research for the investment casting lost wax process. They developed a cobalt-nucleating agent, which is an integral material for the manufacturing of jet engine turbine blades and medical devices. The company experienced tremendous growth by supplying cobalt aluminates to investment casting manufacturers worldwide. Ron and his wife, Marjorie Franklin, had three children: David, Ann and Carol. In adulthood, all three children were active in the business. When Ron passed away in 1991, David became president of Mason Color and Ann and Carol served as vice presidents. During this time, Mason Color expanded into supplying pigments to the ceramic gas log industry. George Vardy, a family friend and ceramic engineer, joined the sales force at Mason Color in 1995. He had an idea that Mason Color's inorganic pigments could be used in the pool and spa industry. His hunch was correct. With research and many expos later, the pool pigments became an integral part of Mason Color's sales. After David's untimely death in July 2000, a new board of directors was formed to assist in the ongoing development of the company, with ownership still residing with the family. Carol asked Don Linger, a close family friend and business advisor, to serve as president of Mason Color during this critical time. Don accepted and focused on the investment casting industry, a field where he was well-known and respected. Over the course of the next few years, Don and Carol added onto the existing Mason Color facilities in order to improve the flow of production. They purchased two shuttle kilns, new dryers and a large ball mill. In 2002, George Vardy, preparing for his retirement, brought in Mike Henderson to continue in the development of Mason's stains. Together they set standards for quality assurance, introduced new ceramic industry colors and improved pigments for the pool and spa industry. Although George is now retired, he remains on the board of directors and enjoys doing consulting work from home. In 2009, Carol became interested in researching the coatings and plastics industry. Inorganic pigments were being introduced in this field as an alternative to organic pigments in a variety of applications. A new Mason research and development lab was established and a vibro mill was purchased. Mike developed high-performance pigments to be used in vinyl siding, paints and acrylics that can stand the test of time. In 2010, Don Linger passed away after a sudden illness. Carol, with 25 years of experience behind her, became president. She had spent 4 years in the lab running tests and learning about production. She then focused on the business end of the company. Today, she is the majority stockholder and is involved in all aspects of the company. Carol's daughter, Erica Davis, who earned her bachelor of science in business administration from Robert Morris University, also works for the family business, serving as vice president. Erica's husband, Eric, serves as secretary treasurer and plant manager. He is in sales and maintains the investment-casting customers. Erica and Eric have three children, Michael, Matthew and Hannah. A company cannot be successful without a dedicated team. The employees of Mason Color care deeply about the company. Some have been employed here for over three decades. They take pride in their work, and it shows. From the production workers to the lab and office personnel, Mason Color is fortunate to have such a devoted staff. To provide the highest possible quality. To charge a fair price. To ship orders as quickly as possible. To ensure that this high level of service is met well into the future, Mason Color continually invests into the company. We pride ourselves in the ability to support and supply our many customers with superb color quality. We carefully maintain appropriate inventory for speedy shipping. We have earned the trust of many different industries over the course of the 175 years (1842 through 2017). 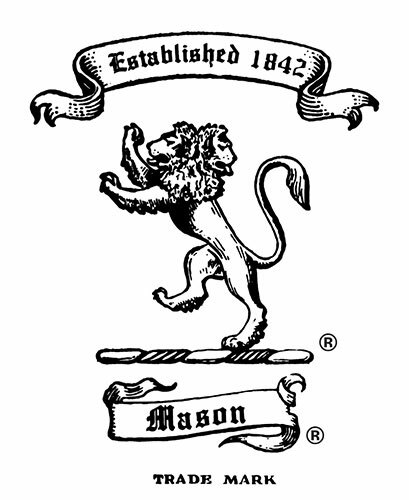 We are dedicated to the continuation of Mason Color's high standards for generations to come.